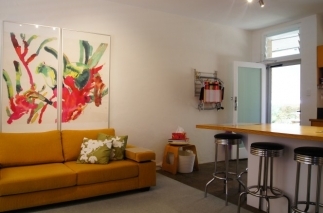 Renovating a small space to make the most of every square inch while also creating a stylish, comfortable and spacious feel can be really difficult. Try making the renovation as green and eco-friendly as possible too, and it’s suddenly even harder! But Fremantle-based Rosslyn de Souza has done it in this former sandwich shop and succeeded, with the end result a beautiful, light-filled, open and stylish abode that somehow doesn’t feel small - despite its tiny 35sqm footprint. 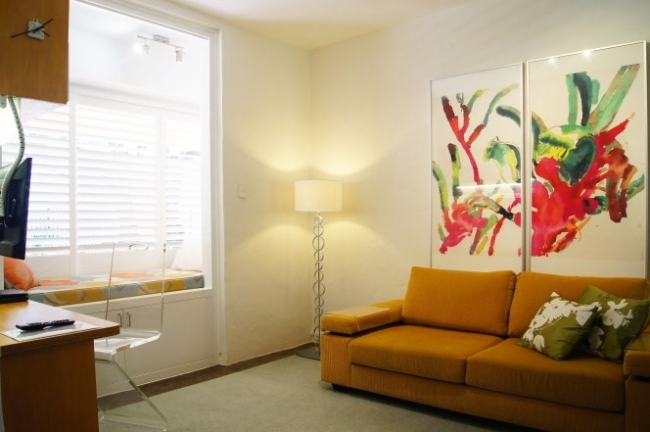 ABOVE: The kangaroo paw painting above the couch was by Ian. The Australian-made sofa was from Harvey Norman and covered in Australian-made Warwick fabric. Rosslyn got the retro-style lamp by V Kool from a friend. 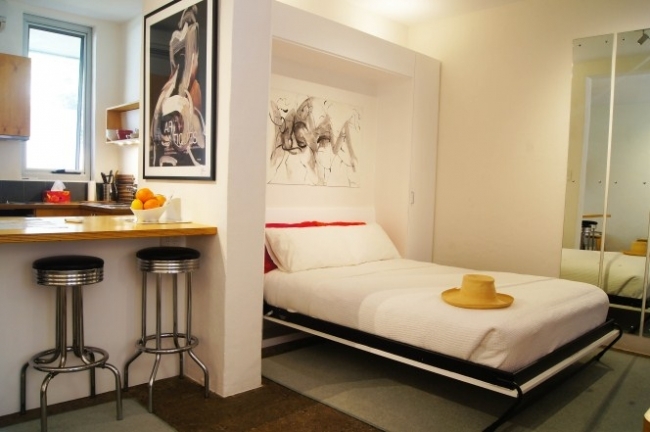 ABOVE: The Murphy bed is usually up during the day. 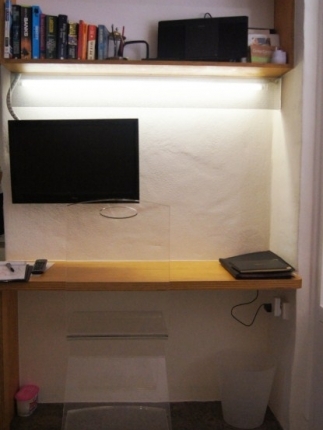 There is a book light in the cupboard for night-time reading. 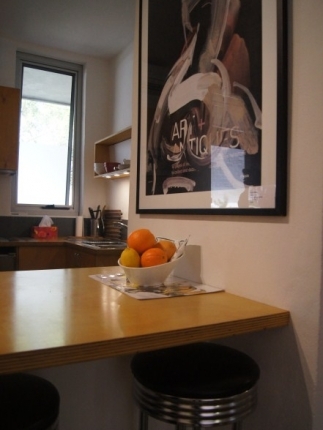 KITCHEN ART: The painting in the kitchen was by Ian de Souza, Rosslyn's artist husband, done on a page torn from an Insite magazine only as he didn't have any other paper available at the time. Realising it actually worked as it was, they then got permission to blow it up and reprint it. The front access to the apartment is into the bed area. 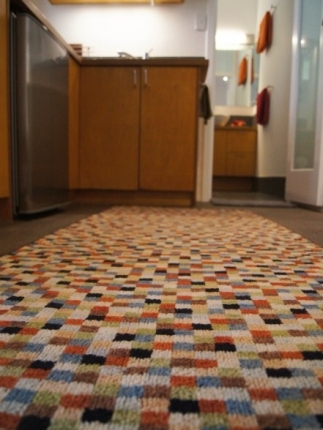 The floors are waxed aggregate. 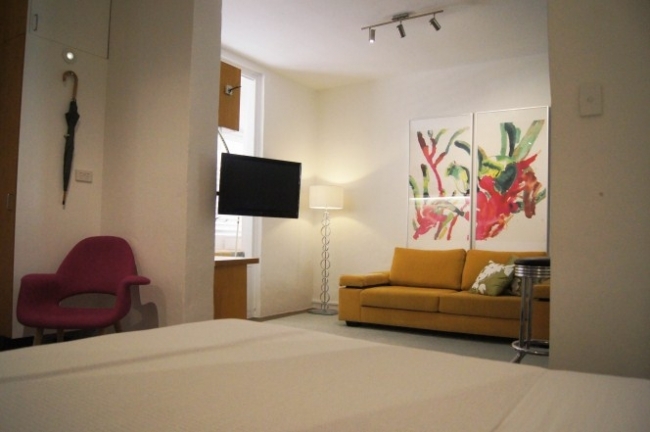 ABOVE LEFT: The bedhead wall before Rosslyn's renovation, when the space was used as a design studio. 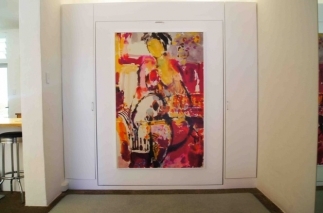 ABOVE RIGHT: The 'afters' - Rosslyn's husband Ian de Souza, the artist, did this gorgeous painting which hangs on the Murphy bed, which is up during the day to save on floor space. Flanking the bed are clothes cupboards. 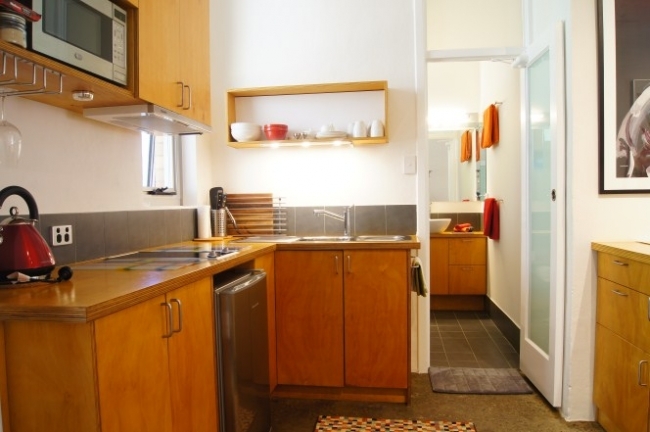 ABOVE: Off the kitchen is the bathroom and laundry. The same cabinetry and tiling throughout both spaces gives a feeling of unity and flow. The kitchen has a charcoal filter above the electric stove and LED task lighting to the dishes area - LEDs were used throughout the apartment. I met Rosslyn for the first time when I wrote about her central Fremantle apartment for New Homes last year, and it’s been a place that’s stayed in my mind ever since. Although technically not a ‘home’ in that Rosslyn doesn’t live in it, but designed it to let out as short-stay holiday accommodation, I wanted to share it with you because I think it’s inspiring to see how she’s made the most of a really small space. 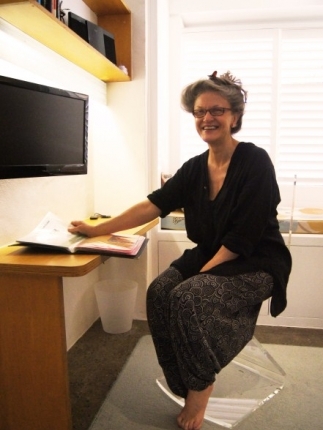 I was impressed by her forward thinking – the apartment is as green as can be, made all the more impressive by its tiny size and the fact that the complex, which features shops and clinics on the ground floor and apartments above, was built in the 1970s. It’s also gorgeous and truly feels good - I can understand why a comment in the guest book reads things like, “Feels like home even being away from home”. 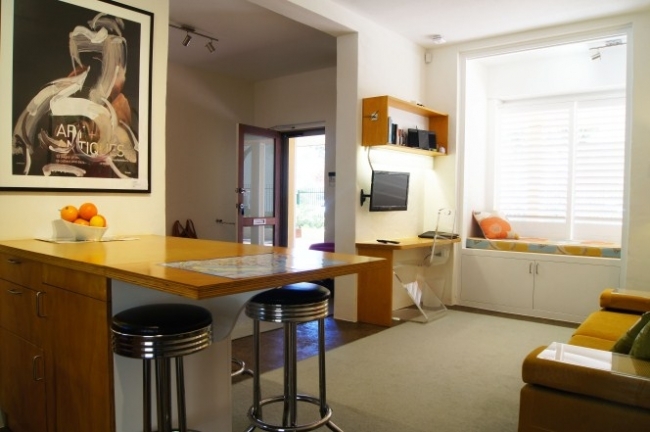 It’s cute, inviting and certainly central, moments from the best of everything in Fremantle. I sure wouldn’t mind living here, if I didn’t have a dog who likes to catapult off the furniture and a fiancé who likes to play FIFA really loudly. ABOVE: The shop when it was a design studio. Rosslyn worked with the existing marine eco-ply cabinetry to create the new kitchen, extending part of it to create a central breakfast bar/dining area. In keeping with her green principles, she oils the cabinetry only with oil suitable for food surfaces and waxes the bench tops with Volvox wax from Planet Ark. 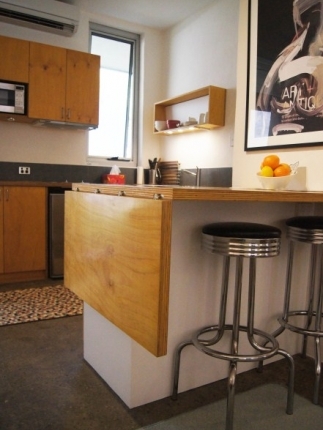 ABOVE: Part of the plywood kitchen breakfast bar is on hinges so it can be pulled up to create a larger dining "table" or pushed down if more floor space is desired. The back door leads to a communal garden. 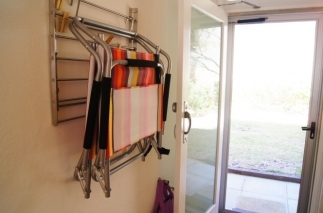 By the door is a drying rack attached to the wall that, when not needed, holds extra chairs for entertaining - I loved this cute idea. Rosslyn added a louvred window above the door for cross-ventilation in hot weather and had the window given a window film for privacy. ABOVE: The studio was painted with natural clay paint which absorbs moisture and dries out naturally to alleviate mould. It’s one of the features that makes the apartment asthma-friendly. ABOVE RIGHT: The lovely Rosslyn on her "invisible chair". When he decided to move to bigger premises, Rosslyn jumped at the chance to turn the studio into short stay accommodation with a green slant, and set about getting council approval and transforming the space into a comfortable abode. Rosslyn says the good bones and high ceilings of the space were one of the features that sold the place to her. “The nice part about it is the ceiling height at 2600 – that’s a must, that sense of light and space,” she says. 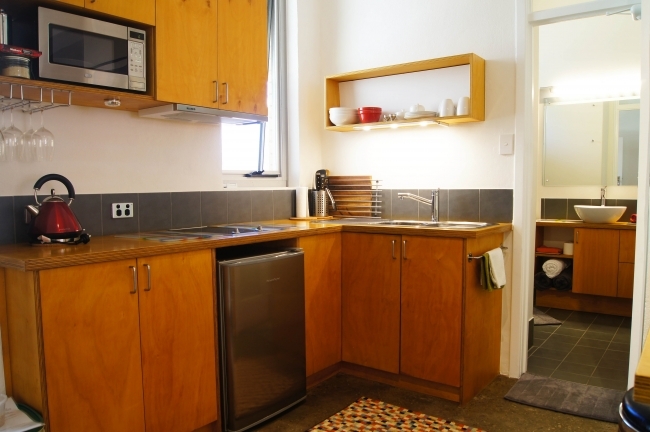 ABOVE LEFT: In keeping with Rosslyn's love of all things free of nasties, the rug in the kitchen is one coloured with organic vegetable dyes. 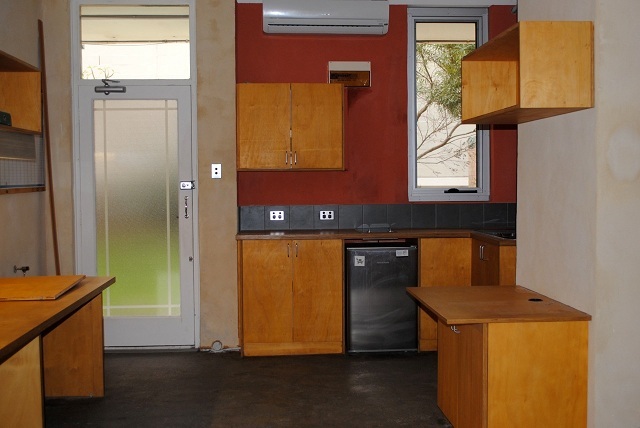 The kitchen also has facilities for recycling, including a Bokashi kit, so that tenants can recycle their food scraps with natural enzymes and turn them into soil improver. 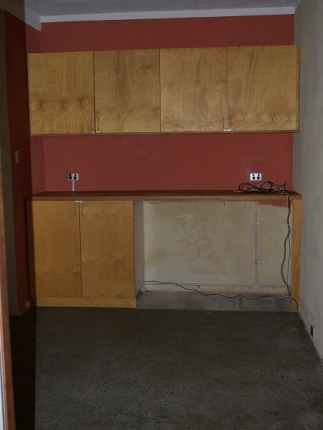 ABOVE RIGHT: The study nook, with screen that can be swivelled around so that people can watch TV from the bed. 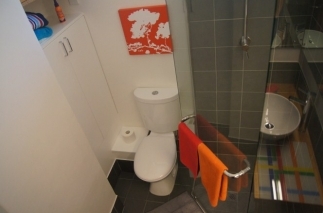 ABOVE: As we're trying to think about how to redesign our tiny ensuite ourselves, I appreciate an excellent bathroom renovation when space is tight! 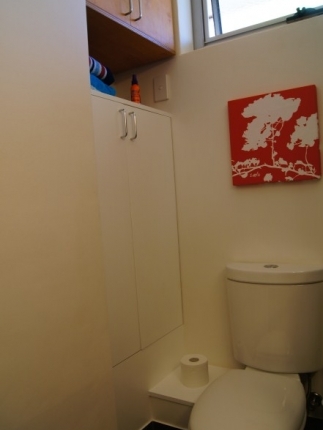 Rosslyn built heaps of storage into hers with a laundry cupboard by the toilet. It was a hard space to photograph but in real life doesn't feel at all claustrophobic. 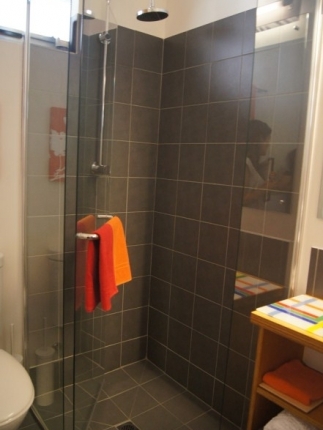 ABOVE LEFT: There's a creepy reflection in the shower!! Oh wait that's me. 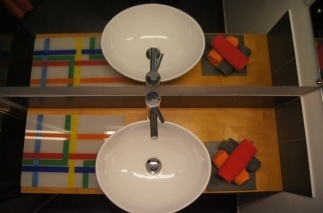 ABOVE RIGHT: One of my pet bathroom design peeves are vanities with large sinks and no benchtop area (probably designed by men). 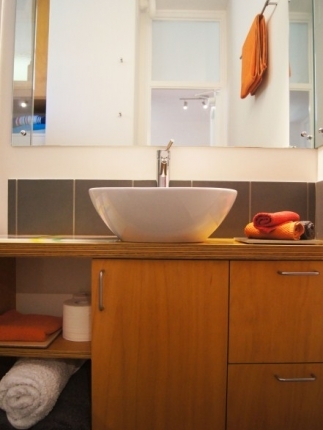 Keeping the basin small gives as much benchtop space as possible. ABOVE: Rosslyn turned the old shop window into a comfortable bed and cute reading nook. 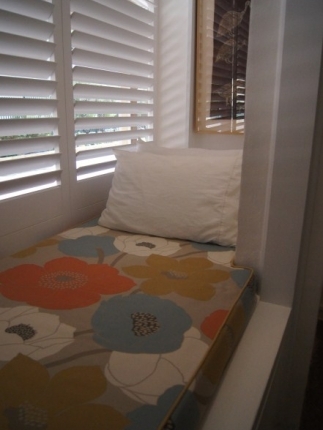 The Australian shutters can be adjusted to darken the space and make it private for daytime naps. The end result is a lovely light-filled abode with storage cleverly integrated wherever possible, such as under the old shop window that Rosslyn turned into a comfortable day bed. I can imagine living here – you could comfortably have ten friends over for drinks before wandering out for a nice dinner in Fremantle. 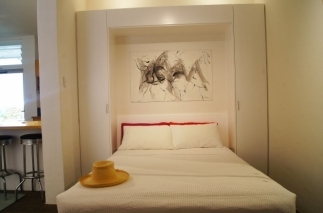 Despite its 35sqm footprint, this place doesn’t feel claustrophobic in the least. “I don’t think I would do anything differently if I did it again,” says Rosslyn. I’m in agreement there. What Rosslyn calls her "intelligent person's clock"
Waxed aggregate floors, natural clay paints, Murphy bed, shop window turned day bed, LED lighting, eco marine plywood cabinetry (free of volatile organic compounds). Products were chosen principally for their Australian-made label (where possible) or purchased from local Fremantle merchants. i have a soft spot for a reading nook so i love that little addition... and the bed design is very clever and stylish at the same time! I'm the same... 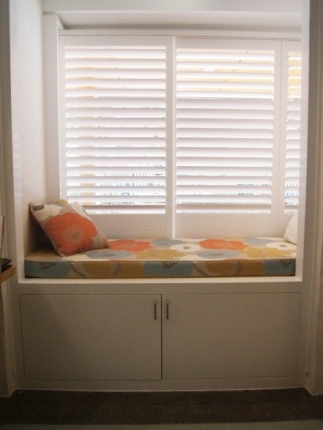 I love special reading nooks. I would snooze there quite happily! So cosy.